Ireland’s economic history is as rich as the island’s political and cultural history. The economy began with bartering and clan settlement and grew with the introduction of other civilizations and their economic ideas and systems, such as the Vikings with cities and coin currency. Ireland’s economic history really takes off in the 1950s. Before then Ireland suffered a famine, war and believed in a protectionist economic system. That all changed with Taoiseach Sean Lamass who started the Republic of Ireland in the direction of outward thinking. That outward focus brought trade and an effort to attract foreign investment. There was also investment in education by expanding the curriculum and paying for high school education with taxes instead of by each family out-of-pocket. With a growing labor force and an outward focus Ireland saw a boom in the 1960s. As a result of world economic problems, in the 1970s, Ireland’s economy slowed as well. However history has a tendency to repeat itself. In the 1990s Ireland’s economy improved dramatically. From 1994 until 2007 Ireland had more growth than any country with its housing market and saw amazing overall economic growth. For being such a small country Ireland has had a lot of impressive and dramatic economic history, both positive and negative. What I find most interesting about Ireland and its economy is how according to the Good Country Index it is the “goodest” country in the entire world. The Good Country Index measures what each country on earth contributes to the common good of humanity. Rankings are determined from data collected in 2010 which is the most shocking part of all. In 2010 Ireland was in the middle of their economic crisis and despite having their banking system and economy crumble around them Ireland, as a country, was still contributing more to humanity than any other country in the world. So no matter what your opinion is of the Irish economy the country as a whole seems to be doing pretty well at the end of the day. Irish Parliament is similar in many ways to Congress in the United States because both have a bicameral governing body. The biggest difference between the two is where the power is held. In the United States the power lies with the upper house, known as the Senate. In Irish Parliament the power falls into the lower house which is directly elected by the people. Another difference is the way that their “senate”, Seanad Eireann, is elected. In the United States there are two senators elected per state, despite the population size, however the Seanad Eireann is elected by local politicians, university graduates, and appointments by the Taoiseach. An interesting practice followed by the Dail Eireann is the questioning of the Taoiseach by the party leaders. During questioning this July there was a bit of heated debate between Micheal Martin, leader of Fianna Fail, and Enda Kenny, Taoiseach and leader of Fine Gael. It was hard to make out exactly what was being said but things got a bit out of hand for a room full of adults. There was also a debate over the new Minister with responsibility for the Gealtacht between Gerry Adams, leader of Sinn Fein, and the Taoiseach. The newly appointed Minister is not fluent in Irish and Mr. Adam was not happy about the appointment. They debated in English as well as Irish, mainly to make a point. Despite having the debates get a bit out of hand, the idea of challenging the Taoiseach is a great political practice. 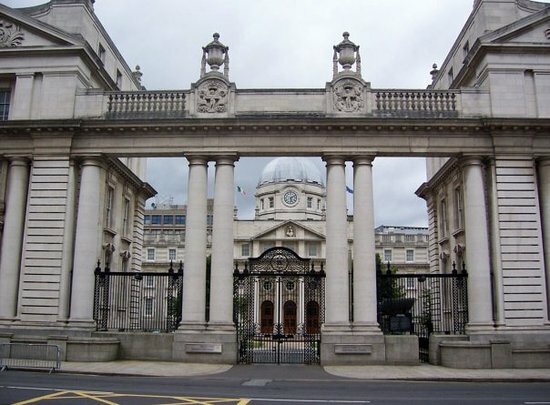 The building where parliament is held, the Leinster House, is rich with Irish history. Leinster House was a building relevant to Irish politics even before Irish independence, starting out as the house for a Minister when there was a parliament in Dublin under British rule. The building has grown and changed since being built in the late 1700s, but has always been a relevant building for Irish history. Conflict is such a small word with such a powerful meaning. Conflict is understood in a few ways and in many different contexts at the Glencree Centre for Peace and Reconciliation. The basic idea of conflict is when two opposing ideas become more than just ideas and turn to action which in many cases is of a violent nature. With that scope a discussion can be had about the Troubles in Northern Ireland. The Troubles stemmed from years of conflict and oppression on the island of Ireland as a whole and more concentrated in Northern Ireland after the Irish war of independence. That conflict took a violent turn in the late 1960s until the Good Friday Agreement in 1998. So much focus has been directed on the conflict rather than the peace process afterwards. It is much easier to compromise or push the past away rather than working on establishing a real and lasting peace. At the Glencree Centre there was mention of the concept of a divided peace which is a rather contradictory idea. While there is no fighting and a joint government in Northern Ireland there are still great divisions in many aspects of life such as communities and schools. Peace walls in Belfast serve as a protection between communities which goes directly against the idea of peace. If there was true peace in Northern Ireland why would there be a need for walls to divide? There is still a concern of safety in Belfast and a fear that if the walls were not there fighting would breakout again. After nearly 16 years after the Belfast Peace Agreement there is still work that needs to be done to ensure peace and that is what the Glencree Centre wants to help with. After a visit to the Centre it is easy to see why there is so much hate and also why there is such a strong need for a real and lasting peace. The longer a divided peace exists the longer it will take to achieve a lasting peace and more prone the area is to slip back into violence. Irish history is filled with great culture and tradition but also horrible conflict and violence. Much of that conflict can be seen between the Irish and English. A conflict which began roughly 800 years ago can still be seen today, in places such as Northern Ireland. Part of the treaty the Irish people made for their independence stated that the territory of Northern Ireland would remain under English rule as their own territory. That section of the treaty with England led to a civil war and, decades later, to a bloody conflict known as the Troubles. It is remarkable how those divisions can still be seen today in Northern Ireland. Even after the Peace Agreement and many efforts to move forward, divisions and hostility can be seen in the peace walls and in murals all around Belfast and Derry. These so called peace walls, reaching 45 feet in height, keep entire communities separated because the fears of attack and violence are still so strong. Children grow up living mere feet from Catholic or Protestant neighborhoods but rarely, if ever, meet children of the opposite religion. How is it fair to deprive one child from playing and getting to know another child simply based on their religion or parents feelings of nationalism or unionism? So many murals depict scenes of violence and terror and are seen as something of pride rather than a solemn remembrance. This can be seen with more than paintings but also in action with the Orange Order’s parade every July. Parades and bonfires can be seen in many places in Northern Ireland which upsets many people. Why can’t it be possible to acknowledge the past without putting others down? History is just that, history, events that have happened in the past. There is no need to brush events from the Troubles “under the rug” however the people of Northern Ireland must learn to deal with these issues in a healthy way before more problems arise. Riverdance is a show that takes the audience on a journey through Ireland from the first inhabitants to an emigrant’s child returning home. The show is filled with rich Irish music, singing and dancing which highlights some of the best parts of Irish culture. One of the most notable moments of the performance was a dance scene that reflected an American wake, which was a party which was thrown the night before family and friends were leaving to emigrate. The American wake became a part of Irish culture during the time of the potato famine because of the mass emigration that was taking place. That just goes to show how something so organic to Irish culture has now made its way into a worldwide performance. The instruments were also very connected to Irish culture. There were four musical solos that have a very strong connection to Irish culture. The uileann pipes, fiddle, flute and bodhran all featured as a solo at some point during the show. In addition to their solos the fiddle and the flute were used during all the dancing as well. Irish step dancing is the backbone of the show which is such an iconic image of Irish culture around the world. There were also elements of Irish folk dancing in their choreography featuring moves from a folk dance the Siege of Ennis. There were also more modern dance elements featured during a dance battle with “local New York” tap dancers. Riverdance was an amazing performance with a full cast of talented musicians, singers and dancers. The show brings many elements of Irish culture to the stage. However there are mixed feelings on how Irish culture is reflected in the performance. There are authentic pieces of Irish culture during the show but that culture is glamorized for a stage performance. Regardless of the views on the performance Riverdance has been a worldwide sensation for 20 years because of the celebration of Irish culture. The Wind that Shakes the Barley was a very moving film with an interesting take on history. Many films that are set during important historical times feature important political and historical figures, which in most is a great thing. Those movies take the viewer through a journey from the eyes of that figure or through the eyes of someone close to them. They give the figures a humanity that tends to be lost over time or when a piece of history is analyzed a great deal. That perspective is great to watch however many times the average person is overlooked in great historical events. Now it would be nearly impossible to tell the story of every single soldier yet The Wind that Shakes the Barley takes a glimpse into the life of a few ordinary Irishmen during the revolution and civil war. Damien and Teddy O’Sullivan are two brothers from rural western Ireland not a place of much significance with respect to the revolution. Although the brothers are from a rural area of Ireland you can see how their involvement with the revolution shifts in response to the British around them. It is clear to see that these brothers are important and leaders in their community and at the same time you are aware that they are nameless with respect to the big picture of the revolution. Damien and Teddy were extremely important to the fighting in their area leading a small militia group. Their militia group launched attacks on British soldiers in Ireland and was even involved in espionage. And that highlights the reality that so much of history is shaped by the efforts of the masses while only a few will have their names written in the history books. That very point is what makes The Wind that Shakes the Barley such a significant film, because it shows the viewer that history is written by more than just those who are remembered with statues and plaques. Although the film does a great job of showing what it was like for Irish people during the revolution the film is a bit slanted. There is little or no sympathy shown for the British soldiers, many of whom had just finished fighting in the trenches of WWI. In addition there was a very slanted political view between the two sides of the civil war. Those in favor of the treaty with England were portrayed as right wing and anti-treaty followers were seen as left wing. Though it makes an interesting story the conflict was greyer rather than black and white. Overall The Wind that Shakes the Barley is a great historically relevant film and worth watching. Brian Friel’s play “Aristocrats” is an exposing piece on the dynamics of an Irish wealthy family in a fiction town based loosely on county Donegal. One look at the set tells the viewer that there is extreme disrepair or even a fall from grace. This “big house” that once sat commanding on top of a hill is slowly losing its luster and, even more notably, its power. The disrepair of the house directly reflects the disrepair of the family who are tied to it. Each generation’s male figure has fallen further and further from power into lower roles in the justice system. From Supreme Court member to a failed solicitor, which is lower still than a barrister, the family has fallen right alongside with the house itself. Each of the characters has a part of their life or self that they try to keep hidden. Claire, the youngest daughter, seems to have some kind of medical condition that stifles her participation in society. It appears that she is almost being forced to marry with a groom that would normally be ill fit for a young and talented girl. Eamon and Judith seem to be hiding a past which is revealed later in the play. Alice poorly hides her alcoholism and her bruise she received from Eamon. Casimir seems to hide the most it is unclear whether the life that he talks about in Germany truly exists. There is much speculation, even from his own family, as to the reality of his so called wife and children in a place they have never visited. Having the American professor come to the house exposes many of the realities in each of the characters’ lives. Every person who talks to the professor seems to give him contradicting stories about the people in their life or how things were growing up. Alice on more than one occasion tells the professor that all he has been hearing are lies. The worst offender of all would be Casimir who tells the professor fantastic stories of famous musicians, politicians and aristocrats who have all been to the big house.